Keith Scott was shot five days ago on September 20th while waiting to pick up his daughter. Witnesses say he was reading a book when police, searching for some other person who was black like Scott, ran up and ordered him out of the car, then screamed “Drop the Gun” and shot him four times. The police chief was quick to claim Scott was armed an a gun was recovered at the scene. The police at first refused to release video from the incident. Initially they claimed there was only one video. After the Scott's family saw the video, a second body camera video was released. Charlotte Police Chief Kerr Putney initially claimed the video showed that Scott was armed. “He was holding a gun not a book.” Kerr said in initial statements. After the dashcam video was shown to the family, he agreed that no viewer could say with certainty that Scott had anything at all in his hands when he was murdered. The mainstream press did not notice his backpeddling. While the police have been claiming Scott was armed they waited until today to claim the gun they allegedly found at the scene has his DNA and fingerprints on it. Photographs of the so-called evidence cause the police version of events to completely fall apart. The relevant photos are posted in composite at the top of this article with bright red arrows to show the reader where to look. Police also released a photo of a half smoked something they claimed was marijuana belonging to Scott. We did not bother to dignify that with a re-print. The ankle holster has three bloody fingerprints on it. 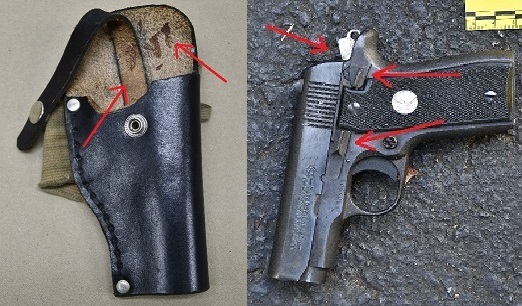 They are vaguely in the correct places on holster to indicate that Scott had drawn. The holster was not photographed at the scene but on a table. There is no time stamp on the photo and nothing to connect it visually with Scott or the location. The photo creates an obvious lie as it is completely at odds with what can be seen in the released video. Scott walks backwards, is shot four times and falls. Standing or lying on the ground dying his hands never go below his waist, much less to his ankles. Had he drawn before he was shot, there would have been no bloody fingerprints on the holster. The fingerprints happened after the gunfire not before. The holster was planted and so was the blood. The police released evidence that they manufactured at odds with other evidence. There is no other way for the blood fingerprints to happen. The gun pictured was photographed on asphalt that is presumably the parking lot where Scott was shot. It shows a .380 Colt Mustang, a small six round semi-automatic pistol. In the picture both the slide lock and the safety are off. The hammer is cocked. The gun is ready to fire. Since the video did not show Scott drawing a weapon, then working the slide to chamber a round and cocking the hammer back, and taking the safety off, these actions had to have happened off camera. A Colt Mustang is a single action weapon. For the hammer to be back the weapon must have already been fired once or the gun owner must have already cocked it. No explanation has been given as to why Scott would be doing something as prone to an accident as driving to pick up his child with a round chambered, the safety off and the weapon in an ankle holster. A person with this sort of habit would have blown their own foot off long ago. Together with the officer who was firing asking if the camera was on leads a person who then examines what the other so-called evidence shows to conclude that the gun was planted after Scott was dead. If the gun was planted, then the police lied about everything else, and have killed yet another unarmed man in front of his family.